There are 170 reviews of Jaïpur Homme. I only wish there was a rating above "Thumbs up". This fragrance is old-school, spicy, barbershop, and completely wonderful. It was once described to me as "opulent", and that is fitting - it's like being in a Raj's palace. A true classic for every minute it's being worn. You definitely get the cinnamon, the powder, and the exotic nature of Jaipur, and at the price, I don't see how it can be beat. Longevity and projection are excellent. I've gotten 8+ hours on my skin, and I'm not sure it ever becomes a true "skin scent". It's easy to overapply, so be careful there. I'd suggest starting with fewer sprays than you'd use for other fragrances. As long as you don't use too much, it's not overpowering to others around you. This review is for the EdP version. I haven't tried the EdT. There are those certain fragrance types that are perennially popular, and "barbershop" is one of the classics that I doubt (quite thankfully) will ever go away. As big as the fragrance market is, there are very few scents that really get the "barbershop" feel right, and I'd say that Jaipur Homme is one of them. It's a powder-bomb, for sure. On first spray, it actually reminds me of something that one of my grandmothers would wear (she was born in 1922), and I could almost see this next to her bottle of Emeraude (1921) or Shalimar (1925). The fact that this was created in in 1997 -- by Annick Menardo, no less -- seems kind of shocking to me, as it is in no way reminiscent of some of the super-synthetic melanges of that time. Jaipur accomplishes its job in an understated way that is very stable and refined. The bergamot is curb-stomped into submission by the heliotrope during the opening, and that's not something I object to in this case. Clove is present all the way from opening to close, and it adds a pleasant stinger to the powder, keeping this from being an overly powdery mess. This is also accompanied by a noticeable nutmeg and a more reserved vanilla and cinnamon. Thankfully, the vanilla is restrained, which keeps this from being one of the infinite -- and overdone -- gourmands that have saturated the market for quite a while. The base doesn't veer all too far from the opening, but that could be because -- as others have pointed out -- it gets to the drydown awfully fast. It settles into a nice, powdery, vanilla-fougere scent, and a well-done one at that. This one sticks around for a while, though projection doesn't match the intensity of its duration. You'll be smelling it for a while. Whether others will; that's not as certain. It really is a "barbershop oriental," and is probably my favorite of the barbershop scents, save for Rive Gauche pour Homme (2003), which still holds the top spot in my book. This is nice enough to wear during the evening, yet still restrained enough that it wouldn't come across as inappropriate in an office or professional setting. This definitely shines during colder weather, and is not recommended during hot, humid days; standard oriental rules still apply. If you're into barbershop scents, I think this one is a no-brainer -- in fact, I'd go so far as to call this a blind-buy. Definitely a thumbs-up from this guy. Boucheron would have a hard time out-classing it's own Boucheron Pour Homme (1991), so instead, it seems they just didn't try and went for clean comfort. Jaïpur Homme (1997) initially had very Art-Deco metal cladding around the bottle, and tons of nebulous advertising to make it seem mysterious and sophisticated, but perfumer Annick Menardo would deliver an interesting hybrid of barbershop fougère and rich oriental. Jaïpur Homme straddles the line between something like Aramis JHL (1982) or Calvin Klein Obsession for Men (1986) and Canoe by Dana (1936) or Avon Wild Country (1967), but surprisingly without the assistance of lavender. I will admit that in it's Eau de Parfum form, Jaïpur Homme is still one of the classiest oriental hybrids I've ever smelled, and comes in a close second behind Boucheron Pour Homme, but anyone looking for a scent that exudes the same level of refinement will be disappointed. 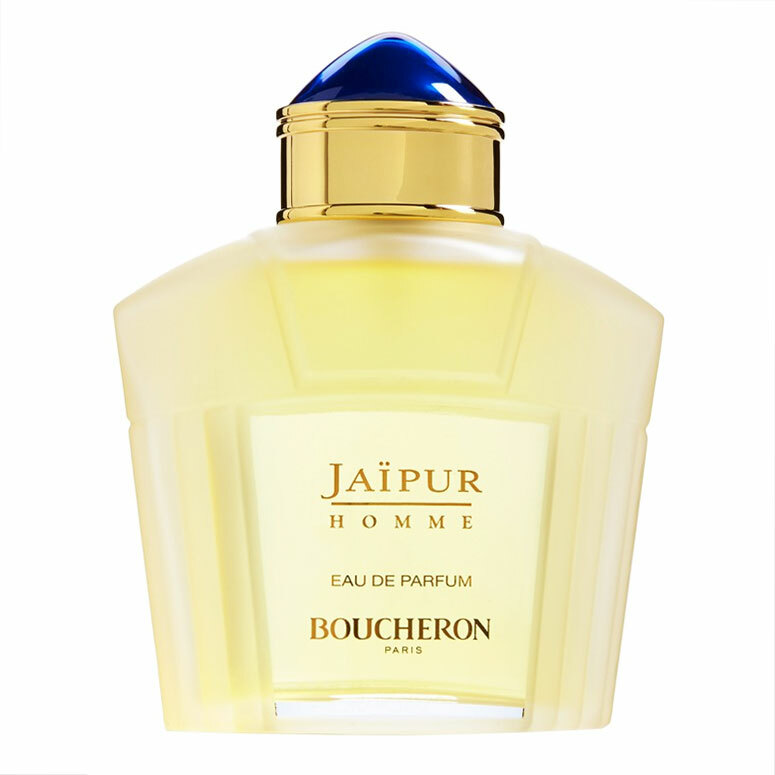 Rather, the original Boucheron Pour Homme is the classy evening choice, while Jaïpur follows a morning wet shave or barbering by the same man. Original metal-clad bottles have a bit more clove and more oakmoss, but any version of this is worth seeking out for a balanced semi-oriental barbershop experience. Jaïpur Homme opens with bergamot, lemon, lime, cardamom, and heliotrope, providing a semi-powdery start thanks to the latter, and unintentionally hearkening back to many an Avon scent from decades past for me (since heliotrope was a big one outside amber for that house). Nutmeg, carnation, rose, and jasmine come next, with only the nutmeg really standing out amidst the well-blended florals. If Wild Country were rounder and softer, this is how it would turn out. I'm also reminded of another Avon called Starring! For Men (1997) which coincidentally came out the same year and has a similar citrus and nutmeg floral softness. That scent featured more of a bakery vanilla vibe throughout while Jaïpur avoids the gourmand tones by dialing down vanilla in a well-blended fougère-like base. Amber, tonka, cedar, oakmoss, and clove join the final skin glow, once again returning this to a hybrid between barbershop clean comfort and oriental sensuality thanks to the clove and vanilla playing with coumarin and oakmoss. The dry down from the citrus through the florals is quick, and you'll find that the most time is spent in the base with Jaïpur Homme, so that's the area you need to pay the most attention when deciding if this is right for you. The kind of person who will enjoy Jaïpur Homme is one who wants a rich and quality barbershop experience beyond that of a typical fougère, and likes the idea of oriental spice but finds most typical full-on entries in the genre too stifling. Jaïpur Homme can be worn in more than just cold weather, even if summer time is a definite no-no, so this has a bit more versatility than the usual specimen. Sillage is mild but longevity is very good, and like a lot of oriental perfumes, this creates a close personal bubble of creamy sweet spice. 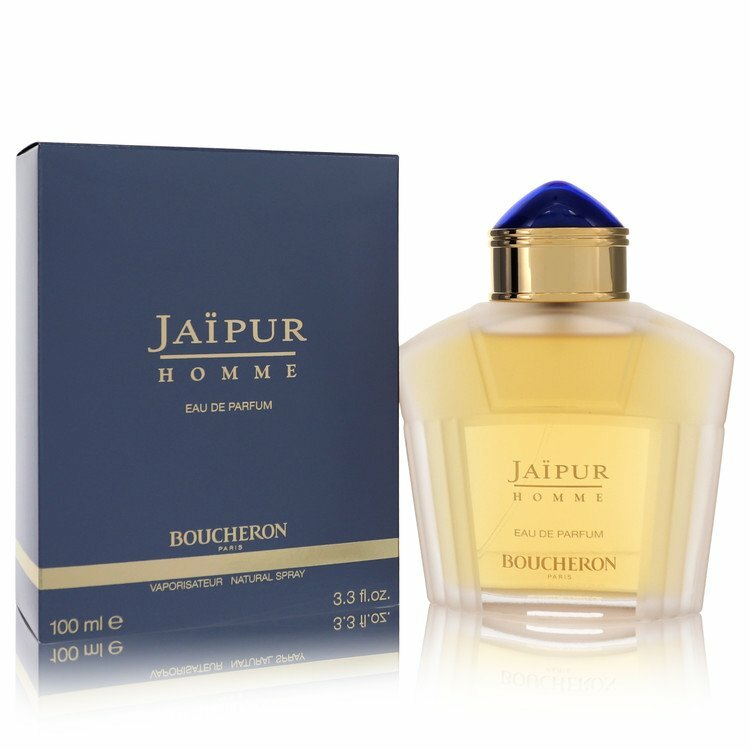 I highly recommend Jaïpur Homme as good bang for the buck in casual or office spaces, and although it doesn't punch above it's weight into niche levels quite like Boucheron Pour Homme, people will definitely think you're wearing something expensive, if you care about that sort of thing. It would be 20 years before Boucheron made another stand-alone masculine, but they'd "flankerize" both this and the preceding eponymous masculine to death in those two decades. I can't speak on those, but I will say it's a testament to the sheer quality and reputation this otherwise little-known house has if they can get away with that for so long. Thumbs up! This has aged like a fine Bordeaux since its inception 20-some year ago: upon first application it greets you with a fresh/citrus combination of lemon and cinnamon, along with a hint of lime. The combination comes across as a barbershop that I may have once dreamed but never visited ( this is likely reinforced with the bit of carnation that slowly creeps with the scent as it dries down on your skin). A distinguished smell without being dated. The longevity for me was not the monster that others have found, 4-6 hours. The projection was moderate (just more than arms length), not disappointing but with this scent I would have enjoyed slightly more projection. I found both of these to be about average. At the current price (approximately 25-30 dollars a bottle), it should be a definitely blind buy and part of every man's collection. Excellent! a fragrance, I'll never be without. All these yrs, and the reformulation is still as relevant as the vintage bottle, of it. Cinnamon, done right...to perfection, with benzoin and tonka bean, walking hand in hand with it. It stands right next to your better niche, cinnamon juices. 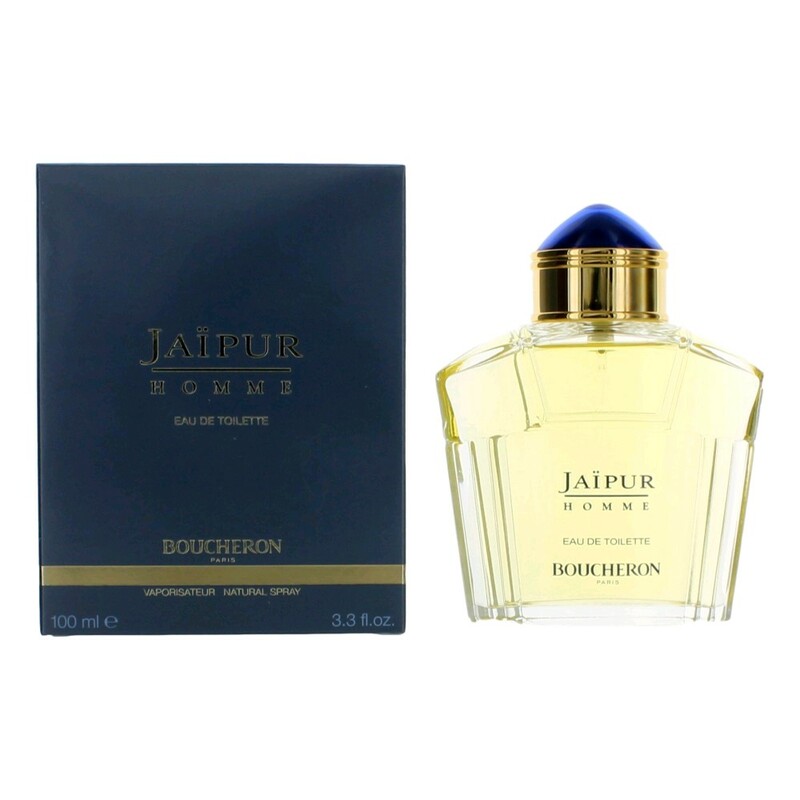 jaipur homme boucheron edt and edp notes? jaipur homme boucheron and ck dark obsession? 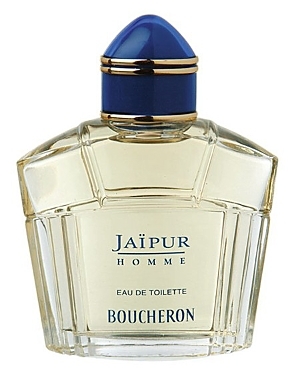 Is Boucheron Jaipur homme right choice?